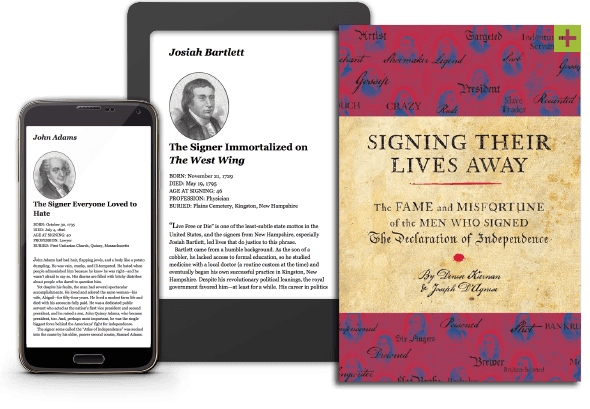 On the morning after the New Hampshire primary, try this on as “the hair of the dog” — a YouTube book trailer for Signing Their Lives Away: The Fame and Misfortune of the Men Who Signed the Declaration of Independence by Denise Kiernan and Joseph D’Agnese (Quirk Books). These 56 signers were our company founders, so to speak, the men who created the American brand. This video, which manages to be cheesy and classy at the same time, humorously tells us what became of them: Shot! Drowned! Poisoned! Memorialized as the name of a New Jersey Turnpike rest area! (That’s Richard Stockton.) Or on “The West Wing,” one of TV’s best workplace dramas! (That’s Josiah Bartlett, seen below.) This tongue-in-cheek book promotion can serve as an inspiration for any organization’s exploration into its founders.